Buick had a banner year in 2015. But things are just getting started. 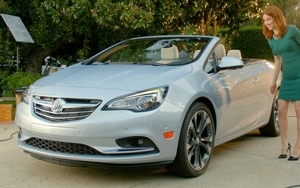 Three new vehicles are coming to the U.S. market this year: the new Cascada convertible, a redesigned LaCrosse sedan, and a much-needed compact crossover, the Envision. But the message is still focused on the surprise that people have when they realize that the cool vehicle they’re looking at is a Buick. The automaker will get that message across to tens of millions of people with its first-ever Super Bowl ad. But kicking things off is a digital-only campaign that launched last week featuring “Unbreakable Jimmy Schmidt” star Ellie Kemper in a series of humorous vignettes, in which she imagines herself in various scenarios with a handsome guy she meets. Oh -- that Cascada she’s sitting in to impress the guy isn’t actually hers. Marketing Daily spoke to Molly Peck, Buick’s director of marketing, about the GM brand’s big plans for the year. Q: First question, the obvious one: Why the Super Bowl? A: The number one barrier to Buick brand growth has been people saying they don’t hear enough about the brand. Now we are launching more vehicles than we have in years, so we have all this great new product, and the Super Bowl. How much more perfect could it be to have over 100 million people learn about Buick’s great portfolio and brand story? Q: You have been staying with the “Doesn’t Look like a Buick” theme for a while. How has it proved effective? A: The campaign has been in market for almost two years — it debuted in March, 2014 — and there are lots of elements about it that make it good. It features likable, relatable, approachable people. But also it is based on truth. It is mirroring real life, and the experiences people are having when they discover Buick, and learn that we have this lineup. Remember, not long ago it was thought of only as a sedan brand, but in 2016 we have three sedans, three SUVs and a convertible. And last year, 60% of sales were SUVs. There’s a change happening in real life that we are mirroring in communications, which makes it relevant, believable and motivating. Q: Your ads are humorous, but I’m wondering if that is the right tone for a premium auto brand. A: I think that, when we talk about Buick as approachable, it’s humor that helps us achieve that resonance. A lot of luxury communications can be very self-important, but we are almost self-effacing in our humor. Q: But the next generation of buyers really has no perception of Buick, right? A: For the next generation of buyers we are a neutral; they just are not thinking about us. And that’s where properties like the Super Bowl come in, because that gets us a chance to break through. Q: Are other big sports events, and tentpole marketing a bigger part of the media plan this year? A: Big media has been part of our plan for a long time. We have been official partners with the NCAA for years and we will continue; it’s fantastic for us because it reaches a terrific audience of people who are a really strong demographic and with sports properties, it’s highly engaged programming, so every year one of the biggest properties is March madness, and it will this year, too. Q: Is Buick a luxury brand? Where does it live in the spectrum? A: For years we have talked about Buick as approachable luxury. We have found a sweet spot playing in places where our competition isn’t, and even when [competitive vehicles] arrive, we have been able to hold our own. A good example is Encore [Buick’s compact SUV] where we have been able to establish a segment. Sure, there is competition coming from many competitors, especially much bigger brands. But still, in 2015 we were able to hold the number one sales spot for compact luxury SUV.